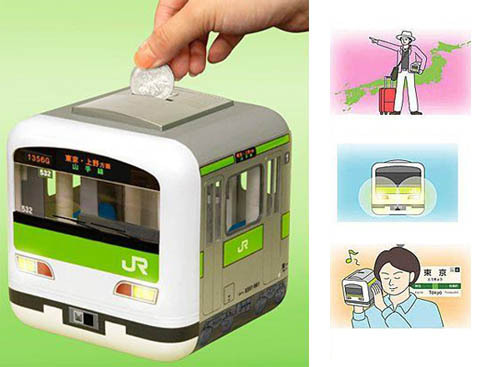 If you're counting the pennies right now, but have a spare £45 you might want to buy a cute piggy bank modelled on Japan's Yamanote subway trains. Thanks to McBazza, for sending me the link from Gizmodo. Whenever you put in money, the train plays a random melody from a Yamanote station. I love the copy from Gizmine which is selling the trainbanks "(Each station has its own pleasing melody, allowing your subconscious mind to track where you are while you sleep, and waking you up just in time for your station!) The headlights come on at the same time. " The image of people wandering onto trains with piggy banks held to their ears like ghetto blasters, is a bit hard to swallow. But perhaps you could give a pile of coins to a fellow commuter and ask them to load up the bank while you sleep. 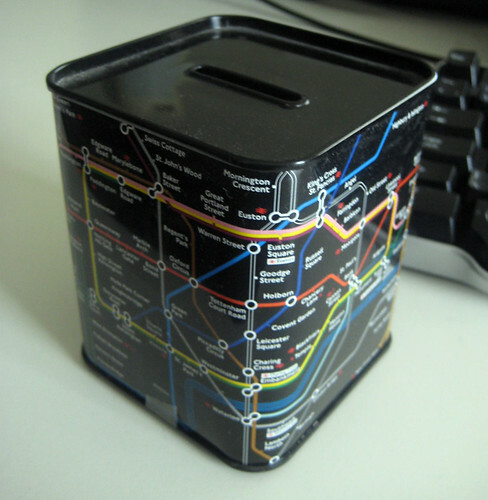 If anyone could work out how to get the same mechanism in my London Underground money box, I'd be most grateful. My money box was a fair bit cheaper than the trainbank above and had the added bonus of being filled with toffees. 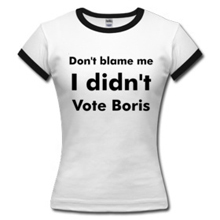 Perhaps it could be triggered to say "Mind the Gap" or "The next station is Cockfosters" and other melodious things at the drop of a coin.